Don't sit on any more bleachers without this chair! It is both comfortable and warm while it relieves back pain. This item is essential to any great game experience. Available in regular width (17") and deluxe width (20"). This really made cheering on my team much more fun! 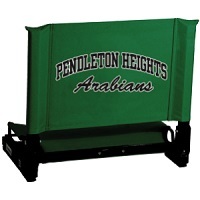 Instead of sitting on cold, hard, uncomfortable bleachers, I was the envy of my section with my cool new chair!